Cassie Binegar doesn't like change. She's not happy with her family's recent move to the shore, and she feels guilty that she and her grandfather had an argument just before he died. She also constantly compares her family to that of her best friend Margaret Mary, assuming that Margaret Mary's neat, organized, and well-dressed parents are normal, while her more laidback family must be odd. Cassie longs for a space of her own, away from it all, but instead gets a visit from her grandmother, and a surprise meeting with a real, live author, both of whom help her to come to terms with her guilt and look ahead to her promising future.This is another of Patricia MacLachlan's introspective and descriptive novels for which it is not always easy to imagine an audience. (Others include Kindred Souls, Fly Away, The Truth of Me, and White Fur Flying.) In addition to lots of complicated emotions, this book uses strange metaphors (such as an aunt who wears feathers, and an uncle who wears hats and speaks in rhyme) and poetic descriptions to paint a picture of the world as Cassie experiences it. Some elements of the story itself - the deceased grandfather, the inter-generational relationships, the baby who doesn't talk yet - are recurring themes in MacLachlan's work which I recognized from more recent titles such as Fly Away. Other things, such as the desire to write, the need for space, and an overall introverted worldview were new to me, but equally satisfying. Some of the images - such as Cassie hiding under the table and being spotted by the visiting author, or writing her feelings in the sand with a stick - stayed in my mind long after finishing the book, a testament to the strength of MacLachlan's word choice and powers of description. For adults, undoubtedly, this book is a treat.For kids, unfortunately, this book is probably the kind of thing most of them won't read unless it's assigned and won't appreciate even then because they will be forced to analyze it. Still, it is beautifully written even if it is strange, and for a reader in third or fourth grade who likes to be challenged, it could be a surprise favorite. The book started out OK, with Cassie disliking everything because she is still dealing with her grandpa's death, which she feels indirectly responsible for. To top it off, her parents move from the house she loved and grew up in and where she had her own room, to a new house where there doesn't seem to be a place for her. She's a born worrier, and adolescent on top of it. That I can deal with. I remember it well. But...sigh. Cassie (named for the ever-moaning Cassandra of Greek legend?) 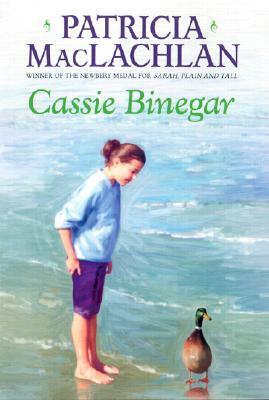 is too often directly adressed by her full name "Cassie Binegar." Yes, yes, we know it rhymes with vinegar. Don't tell us quite so often. But her relatives and close friends wouldn't use the whole name like that.The interesting thread of what's really going on with her best friend just peters out. Yeah, for much of the novel Cassie is so self-absorbed that she wouldn't notice much, but man--her friend puts out all kinds of throwaway little remarks like "things aren't as perfect as they seem" whenever Cass admires her life, and Cassie never bothers to say, "What do you mean?" Some friend. It's allll about me, innit Cass? Uncle Hat and the other feather-obsessed cousin turn up with a baby in tow, and we aren't told much about them, either--like WHY does he speak in rhyme? The last "chapter" was a real disappointment. Even in a small beach town, I feel pretty sure that "article" wouldn't have been convincing.Do better, Patricia. I know your output is pretty uneven, but I know you could have done so much more with this. What a disappointment, I really can't recommend this to anyone. This is a great book for a young girl, say between 11 and 13, but I still enjoyed it, even though I am well beyond those ages. Ms. MacLachlan seems to recall quite well how difficult it can feel to be out of place in your own family and not know what to do or what one should do to change it. The chapters are short, the characters are well developed and Ms. MacLachlan explores the curiosity, sadness, frustrations, happiness, loneliness, and even the hint of a first love of a young girl. I would recommend this book quite highly. I first read this in the 4th grade and it remains one of my all-time favorite children's books. It reminds me of Madeleine L'Engle's quote that when she has ideas that may be too much for her adult readers, she puts it in a children's book instead.Beautifully crafted setting, and an easily-imaginable and loving family. Themes of Cassie's reluctance towards change are as accurate, familiar, and poignant as any I've read elsewhere at age 25.
recently found a used copy of this childhood favorite. the cover of the edition i remember reading features an extremely grouchy looking girl wearing a pink shirt.maclachlan's books, which i adored as a kid, stand up well to the test of time because her writing is so well-crafted and lyrical and the characters so vivid. not necessarily realistic (uncle who constantly speaks in rhymes didn't actually age that well) but vivid. enjoyable reread. Great characters who are full of life and a lesson about change in this book. I always enjoy MacLachlan. See http://www.eatreadandbemommy.com/2015... for more! it was a ssoft but slightly enjoyable book that I really came to love really good bookread! Great book about growing up, loss, and change. I re-read this book every summer and am always in awe of its relevance and beautiful prose. Patricia MacLachlan - Patricia MacLachlan was born on the prairie, and to this day carries a small bag of prairie dirt with her wherever she goes to remind her of what she knew first. She is the author of many well-loved novels and picture books, including Sarah, Plain and Tall, winner of the Newbery Medal; its sequels, Skylark and Caleb's Story; and Three Names, illustrated by Mike Wimmer. She lives in western Massachusetts.